“Fred W. McDarrah: New York Scenes” is a nostalgic and strangely current exhibit, celebrating, as it does, the historic work of a Village Voice photographer less than two months after the publication’s website shut down. 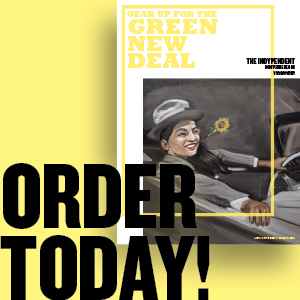 (The print version ended in 2017 with, fittingly, a McDarrah photo on its cover.) By the time it died, the Voice was no longer a brand youth idolized, but at one time it defined New York City cool, and McDarrah was a big part of it. In his long career, McDarrah, who died in 2007, captured alternative culture’s movers and shakers, as well as everyday New Yorkers — from a random group of folk dancers in Washington Square Park to a welfare hotel dweller fighting with a security guard. This exhibit takes us back to one of the city’s most exciting time periods (the ’50s through the ’70s) with such clarity that you can almost hear the shouting of revolution. 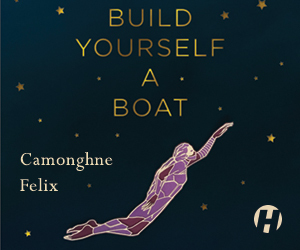 His pictures, deceptively simple looking, communicate deeply-felt messages. Borders are one stylistic trademark — a line in the street, a “Women of the World Unite!” sign held against a building, Brillo boxes stacked up around Andy Warhol. McDarrah also seemed to stretch space in a superhuman way by fitting more into a photo than you’d imagine possible. In short, he elevated photojournalism to its highest form. Kennedy in Stanton Street apartment once occupied by Senator Jacob Javits, May 8, 1967. Copyright Fred W. McDarrah, Courtesy Steven Kasher Gallery. 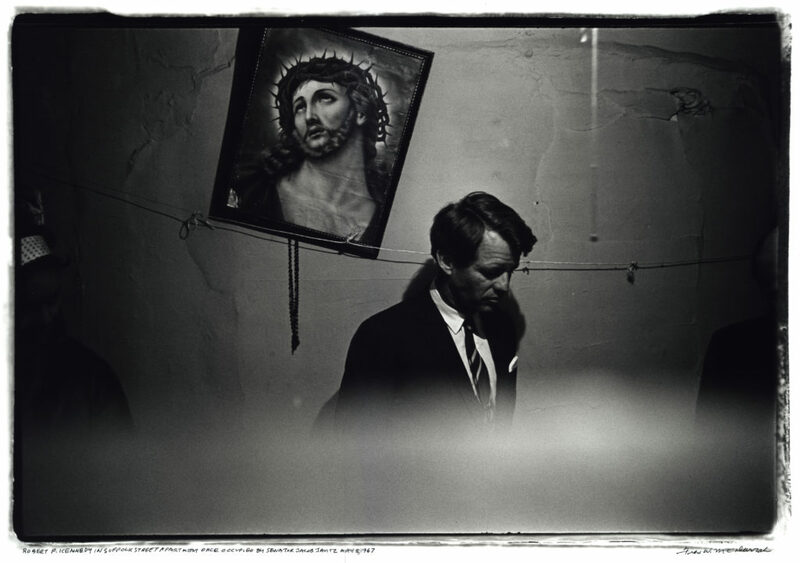 Take his photograph of Robert F. Kennedy visiting a Lower East Side tenement, standing near a picture of Jesus. Perhaps it was a coincidence that he found Kennedy there, but I like to think McDarrah understood the symbolism — Jesus passing the torch to a living representative, Jesus made to suffer like the residents. A clothesline separates Kennedy from Jesus, a McDarrah border that cuts the picture in two: Jesus is up in heaven, away from the apartment, but not so far away that he can’t see hell on earth, the tenement. If this picture were taken by a tabloid photographer, the focus would be Kennedy’s celebrity, but McDarrah made the bleakness of the tenement the star. Kennedy is there to look solemn. When he was assassinated not long after, that same photo was used for his obit in the Voice, changing the meaning entirely. 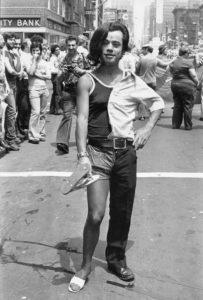 Portrait of a parade-goer at the intersection of West Twenty-Third Street and Sixth Avenue during the Sixth Annual Gay Pride March (Gay Liberation Day), June 29, 1975. Copyright Fred W. McDarrah, courtesy Steven Kasher Gallery. The Beat Generation is well-represented. A photo of Jack Kerouac shows him absolutely commanding a room in a godlike way while reading poetry, his hands powerfully outstretched. In another photo, Allen Ginsberg looks directly into a camera as he is photographed at an anti-Vietnam demonstration, wearing an American flag hat. The photo doesn’t have to show Ginsberg shouting. The hat makes the point: Like Kennedy, Ginsberg wasn’t scared to criticize America when he knew it was headed down the wrong path, and also like Kennedy, that doesn’t make him any less a patriot. Compare this to a picture of a young Donald Trump, looking smug as hell. McDarrah’s camera served as a type of truth serum that could reveal a person’s heart. Most striking among the queer photos is one of a Pride parade-goer dressed as a man on one side and a woman on the other. This person stands in front of a white road line, another McDarrah border, away from the rest, suggesting that even in the LGBT world this genderfluid representative is pushing the envelope. Someone in the background is covering his face with his hands like he can’t believe this is being committed to film. To his credit, McDarrah did not exploit. The person is glowing with confidence. McDarrah’s photograph of contestants in a drag queen pageant brings to mind the repetition that made Warhol famous. (Warhol was coincidentally the contest’s judge.) And again, McDarrah avoided exploitation. He approached what should have been a shocking image for the era in a jaded way. Seeing similarly-dressed drag queens in a line like that can make you realize that this is not all that different from any other pageant. Drag queens compete in the Miss All-America Camp Beauty Pageant at Town Hall, 123 West Forty-Third St., February 20, 1967. Copyright Fred W. McDarrah, courtesy Steven Kasher Gallery. During the famous gay Sip-In, McDarrah photographed men from the Mattachine Society fighting for their right to drink wherever they wanted. Yes, it was once against the law to be gay and drink in public. (Can you even imagine?) In capturing that moment of the bartender’s hand covering a man’s drink, McDarrah captured nothing less than the brazen cruelty of a backward-thinking public. Being that McDarrah was so closely associated with the Voice, it seems strange not to see at least some of his work as it appeared in articles. That — and the fact that there is a picture of a Chicago demonstration in an exhibit titled New York Scenes — are my only two criticisms. (Though I like that Chicago picture. It’s a great photo of protestors expanding into the horizon like an ocean.) We could certainly use McDarrah today, photographing Trump protests and women’s marches and God knows what else because it’s not enough for activists to be out there changing the world. The world has to see activists in just the right light. 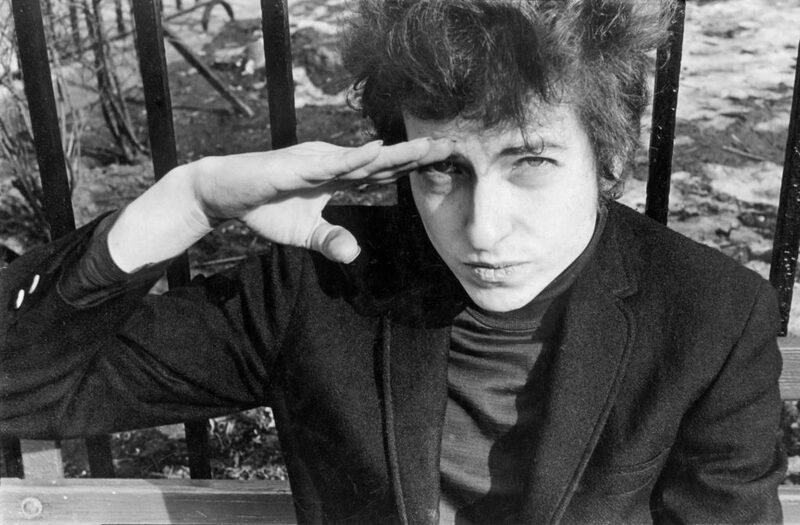 Bob Dylan, sitting on a bench in Christopher Park (across the street from the offices of the Village Voice) either salutes or shields his eyes from the sun, January 22, 1965. Copyright Fred W. McDarrah, courtesy Steven Kasher Gallery. 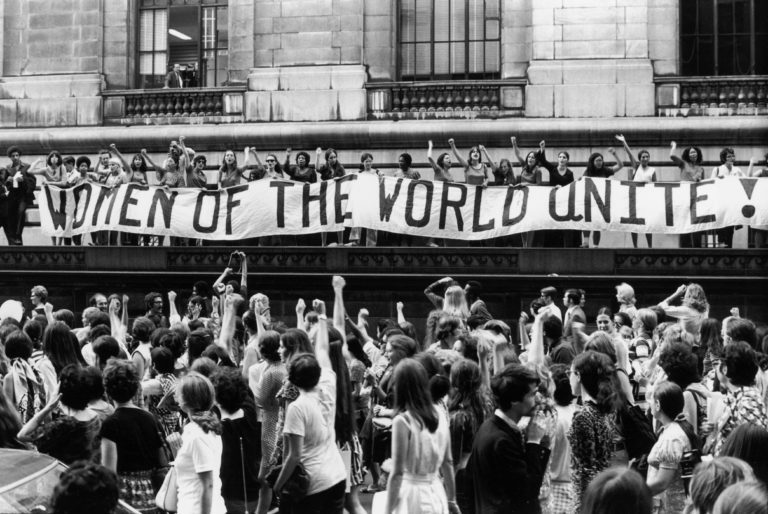 Photo (top): To commemorate the fiftieth anniversary of women’s suffrage in the United States, an estimated twenty thousand women march along Fifth Ave., here past a banner that reads, ‘‘Women of the World Unite!”, August 26, 1970. Copyright Fred W. McDarrah, courtesy Steven Kasher Gallery.